Being that Randi has her own etsy shop and we are always looking for creative handmade items or way to support the small business owners, we were thrilled to hear about another monthly box subscription called Out of the Box Sampler. Out of the box started to get homemade products out into the hands of the public, and to help grow small online businesses You get all kinds of samples in one box with the hope that you will like the products and go to the websites and buy more products. Each month a box is delivered to your door with samples of homemade goodies from all of the shops on etsy and more. I was pumped when we finally heard back from this company and they said they were going to send us over the Spring Box to review. This was my first time trying out a monthly box subscription so it was a new experience for me. 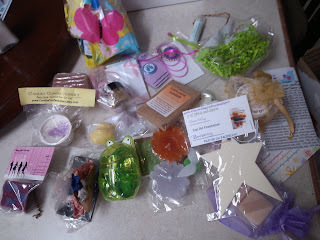 What I loved about this sampler box was that it had a huge variety of soaps, bath salts, candles or tarts, jewelry and some edible goodies. The amount of products that you received for this sample product box was quite impressive. What I received was all of high quality and I could't wait as I wanted to try everything at once. 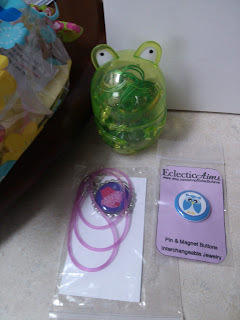 My children wanted the necklaces and fought over the bottle cap magnet with a cupcake on it. The butterfly on a green ribbon necklace was beautiful and perfect for my girls. Unfortunately for me and my super sensitive skin both the cherry soap and the salt scrub made me break out. I should have known better than to use anything other than the one particular soap I can use. 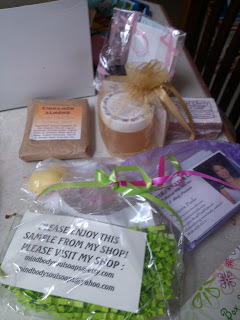 But each of the soaps had amazing scents and even made me hungry when first smelling them. The only thing I did not like about this sampler box was that with having all the strong smelling soaps and the chocolate covered pretzels together...they actually tasted a bit soapy. Maybe not everyone knows that chocolate absorbs the smells around it. So I did not like the chocolate covered pretzels as the cherry soap permeated the air as soon as the box was opened. Recommendation: I do recommend this subscription to anyone who wants to sample a lot of products before committing to spending a lot of money of something that might not be what you want or really need. This all benefits the smaller homemade businesses on etsy and throughout the internet which I have a definite appreciation for! The cost seemed to be beyond reasonable too for the amount of samples I received. Giveaway: Out of the Box is going to give one of A Lucky Ladybug's lucky readers a May box to try of their own! my friend has a small business called "Crafts by Joanie"
I had a GREAT experience over the holiday season with Sweet Vegan Delight. The owner is very sweet and understanding. I had some trouble with my order but she did everything in her power to help me. I buy things from our local farmer's market. I would like to purchase some soaps from Hobbes Art on Etsy. They are the ones that sent the Cherry soap in the last Out of the Box Sampler box. I loved the smell, and they have some other soaps in their shop that sound wonderful too. I just need to use up more of the bar soaps I already have first before buying more! Boring Goats sells soaps made using goat milk. I like the scents that are offered, and I like how my skin feels after using their products, which not only include soaps but also lotions and lip balms. I have bought things from many small businesses. I like each of them for their own style. I don't think I could name just one. The reason I joined Facebook was to see what what out there for 'small business.' The talents abound! I have purchased much from many.. and only had problems/disappointment from one establishment! That was resolved quickly. So actually, I am 100% satisfied. I absolutely love them all! It's my 'preferred' shopping method. my friend has a shop on etsy called Mountain Mud Babies and i have bought several peices of her pottery, which is always beautiful! i am new to your site, so i dont know much about it yet but i do love the graphics! Poppy Soap Co. is a good one! I ordered my first box last month and LOVED it! So many great products from wonderful companies! Juniper is a great small company to purchase from. It's a woman-started company that delivers monthly boxes of tampons & treats. 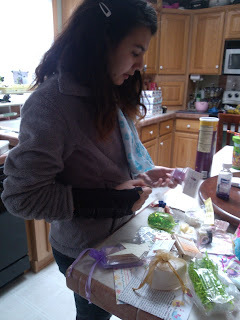 I got an out of the box sampler for my daughter, she loves trying out all different kinds of samples. I just ordered my first box ever!! Very excited!! I just ordered my first box! I'm so excited! Would love to see SimpleMindedBathCo here. They have amazing products.They are on Esty. The Cup is an awesome coffee shop in my little town. Nothing better than a small local business that is better than the chains in the big city! I love Vahalla Soap Company's products! I always support our local farmers market. There are lots of local farmers and craft makers. My friend is the manager of the local market and turned me on to the importance of supporting local business. This year I may even try selling some of my crafts / vegies, who knows. I really enjoy the way you have your giveaways listed on the side of the screen and arranged by date. I've always had success with various Etsy sellers. I don't have a "best" small business to buy from. I just prefer them in general. I really love Bejeweled Bubbles soap and Hidden Treasure candles! I like the fact that the pages load quickly on your blog and it is user friendly/easy to find things. One of my favorite indie nail polish makers was originally found on etsy - NerdLacquer. That was my first experience purchasing there, and it was painless. I don't know the name, but there was this small women's shop on the main drag in St. Maarten, which had cool baskets and jewelry and art. I bought quite a few things that I absolutely love. Local honey from a small local farm is always a great buy, it's so good!